West Swamp Mennonite Church (formerly General Conference Mennonite Church [GCM], now Mennonite Church USA), located between Milford Square and Steinsburg in Milford Township, Bucks County, Pennsylvania, about 4 miles northwest of Quakertown, a member of the Eastern District Mennonite Conference, was organized before 1727. It is possible that it was organized in 1717, when Felty (Valentine) Clemmer, the first minister, arrived in America. According to tradition, the first meetinghouse was erected in 1735 on land owned by William Allen. A marker was erected in 1944 at a spot that is thought to be the site of this meetinghouse, about midway between the present  East Swamp and West Swamp churches. In 1771 a meetinghouse was erected a mile east of the first building. This is the site of the present East Swamp church. Services were held alternately in both buildings. In 1790 another building was erected about one-half mile west of the original meetinghouse on the site of the present West Swamp church. It was replaced in 1819 and again in 1873. In 1847 John H. Oberholtzer began to organize Bible instruction classes in this church. In the Oberholtzer division of that year the congregation joined the new movement, later joining the Eastern District Conference (GCM). As the number of members increased separate congregations were organized (1877), which are known as East Swamp and West Swamp; they continued to be served by the same minister until 1921. In 1958, West Swamp was largely a rural church, though there were quite a few who lived in nearby towns. In 1958 the minister was Arthur S. Rosenberger, and the membership was 281. Mennonite Life II (1947): 33-37. Rosenberger, Arthur S. "West Swamp Mennonite Church (Quakertown, Pennsylvania, USA)." Global Anabaptist Mennonite Encyclopedia Online. 1959. Web. 23 Apr 2019. http://gameo.org/index.php?title=West_Swamp_Mennonite_Church_(Quakertown,_Pennsylvania,_USA)&oldid=136139. Rosenberger, Arthur S. (1959). 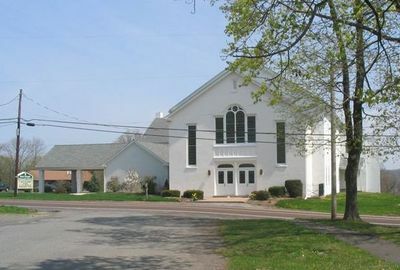 West Swamp Mennonite Church (Quakertown, Pennsylvania, USA). Global Anabaptist Mennonite Encyclopedia Online. Retrieved 23 April 2019, from http://gameo.org/index.php?title=West_Swamp_Mennonite_Church_(Quakertown,_Pennsylvania,_USA)&oldid=136139. This page was last modified on 3 October 2016, at 20:21.